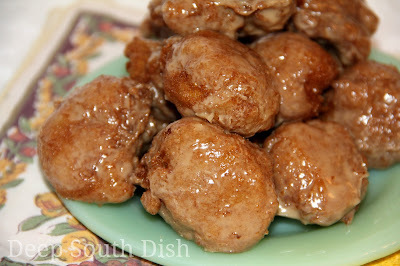 Fried brown sugar and cinnamon dough, filled with chopped apples and finished with a maple glaze. 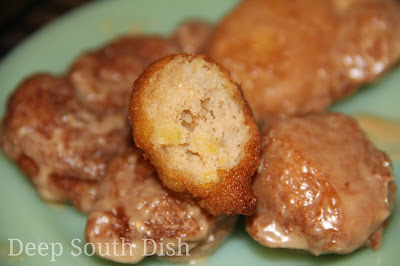 Apple fritters are delicious little bites of puffy fried, brown sugar and cinnamon dough, filled with chunks of apple. What could possibly be wrong with that? I like to finish them with a powdered sugar glaze infused with just a touch of maple extract just because I do love how it tastes with apple. That's, of course, completely optional, as they are plenty good with a basic glaze or even just a simple dusting of plain powdered sugar, if you prefer. Though you may certainly pan fry fritters in shallow oil, and I reckon that many people do, I prefer to cook my drop version in the deep fryer like I do with doughnuts and beignets. Pan frying seems to absorb a lot more grease than I care for with dough and a cast iron skillet can be hard to regulate with multiple batches of tender dough, making you end up with fritters that are burnt on the outside, raw in the middle and greasy. 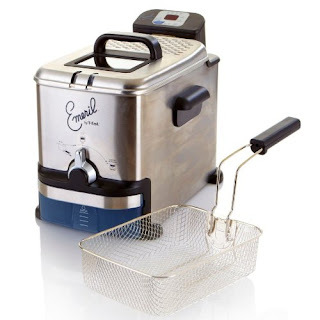 My last upgrade on a deep fryer brought me to Emeril's T-fal fryer. It's actually the second T-fal by Emeril branded small appliance I've purchased that I have been as pleased as punch over, the first being the one slow cooker I have found in years that actually works like it is supposed to. I talk about the slow cooker on my slow cooker beef stew post if you're in need of a new slow cooker. This fryer is a large capacity one, so it can handle a big fry batch as well as smaller batches, the oil gets good and hot pretty quick and has a fast recovery time, but the biggest bonus is the fact that once the oil cools down, it has an easy, automatic filtering and draining system making it super easy not only to clean, but to recycle it over and over, giving you multiple uses. If you have a nice covered patio area, you could easily use it outdoors too, though I would store it inside once you're done and it's cooled off, simply because it is an electronic small appliance. I purchased mine on HSN, it's also available now at QVC, or you can find the fryer on Amazon with free shipping right now, if you're a prime member. Enjoy these fritters while they are fresh and not too far out of the fryer though, because like any doughnut, that is when they taste the best. Here's how to make them. For more of my favorite apple recipes, visit my page on Pinterest! Preheat deep fryer to 375 degrees F, or heat 2 inches of oil in a deep skillet. For the glaze, combine the powdered sugar, extract and add 1/2 tablespoon of milk, adding more as needed until you have a thick but still liquid glaze. If mixture is too thick, add additional milk if needed, one teaspoon at a time; set aside. Whisk together the flour, baking powder, brown sugar and cinnamon in a medium sized bowl; add the chopped apples and toss. Add the egg, melted butter and enough of the milk to form a thick batter. Use a small cookie scoop, or a 1/8 cup measure, to carefully drop batter into the hot oil and cook until browned on both sides, turning over if needed. 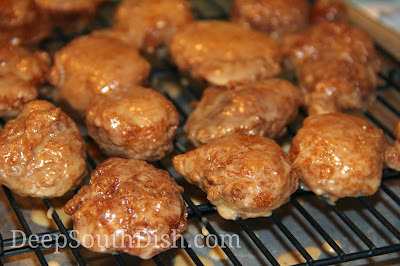 Drain on a rack over paper towels, let cool slightly and dip each fritter in the glaze. May also dust with powdered sugar or serve plain, if desired; serve immediately. Cook's Notes: Substitute vanilla extract if you like. Like doughnuts, these do not store well for long, so eat them up when you make them! Many different apples will work - I used Gala apples this time. If substituting all purpose flour - increase baking powder to 2 teaspoons and add a pinch of salt. Maple Pecan Sauce: For a great sauce to drizzle on top of plain fritters, combine 1 cup of maple syrup with 2 tablespoons of butter and 1/4 cup of toasted, chopped pecans in a saucepan. Bring to a simmer and drizzle warm sauce over the top of the fritters. Yum! And I LOVE your social icons (the cast iron skillets - OMG they are so cute). Apple Fritters are my most favorite type of donut. These look delicious Mary! Hey Lynda! Long time no see!! I need to pop over to your place and have a visit. I just love apple season, don't you? Ha! Wouldn't you know that just Saturday I put away our deep fryer in the garage because it was taking up too much room. These look great and I want to try them in a few weekends when I drag it back out. Try these with cake flour and see how you like them! Ha! I'm not sure if they will be better but We made my Ma's 'fat balls' last Christmas and we used that Swans Down cake flour on them and they turned out very well. I learned this from the cooking channel. Oh I just love this blog! Our oldest daughter and her hubby willbe on vacation during Thanksgiving so I'm doing a big Turkey dinner Friday so they wont miss out on it. I came up with this idea since our other daughter will be coming home from Chicago to go to Detroit Redwings Hockey game (private suite) with her Dad and Sister, etc.. The VanAndel Institute is sending my hubby and 5 of his friends to Detroit with other cancer survivors they have featured in their events. So I had the relishmade and saw that you add pecans and man is that good! P.S.None of us are hockey fans but we will be for a day! ha! As they say,when in Rome... right?! We do a HUGE family dinner either at my cousin's which is my mama's remaining side of the family or my son's which is my DIL's family and my grandbabies, of course! :) So, I actually do a small version Thanksgiving and Christmas dinner just for me and my hubby usually before, so I totally relate. I like roasting a turkey & I can fix the things I love and have leftovers just for us! :) The only time I buy cake flour is for mama's red velvet or caramel cakes pretty much, but there's always a little leftover I have to freeze. Never thought about it, but you're right, why not?!! I have to look for the caramel cake recipe! In NC now on vacation, many of our apple trees are yielding fruit. I used this recipe (altered it a bit used baking mix). I pulled out the Fry Daddy and the family ate them up. The maple glaze adds a special depth of flavor. Thanks for the great idea! I thought the maple glaze really brought them over the top - so glad to hear they gobbled them up!! Looks like my pancake batter recipe! Love your fritters.